It was a busy week last week as we saw 42 economic indicators release. The results mostly surprised to the downside as 22 of these came in below estimates or were lower versus the prior period. Only 14 beat expectations while the remaining 6 came in right in line with forecasts. Chicago and Dallas Fed activity indices kicked off last week with both handily beating expectations. Tuesday saw a string of weaker confidence numbers and a slight deceleration in Case-Shiller Home Prices (although it wasn’t as weak as it looked). On top of an abysmal Pending Home Sales print and mixed EIA data, Wednesday’s FOMC rate decision was the main market mover last week. The Fed’s more dovish tone provided a boost across asset classes. Thursday saw a big miss in Initial Jobless Claims with the government shutdown likely to blame—not due to government workers filing claims, rather the increase being a result of ancillary services and government contractors. Chicago PMI also came in far weaker than expected and was lower versus the prior period. After being held back due to the shutdown, a much stronger than expected New Home Sales print was also released on Thursday. Finally on Friday, the always much anticipated Non Farm Payrolls report showed further evidence of a very hot labor market and reasonably strong economic growth. 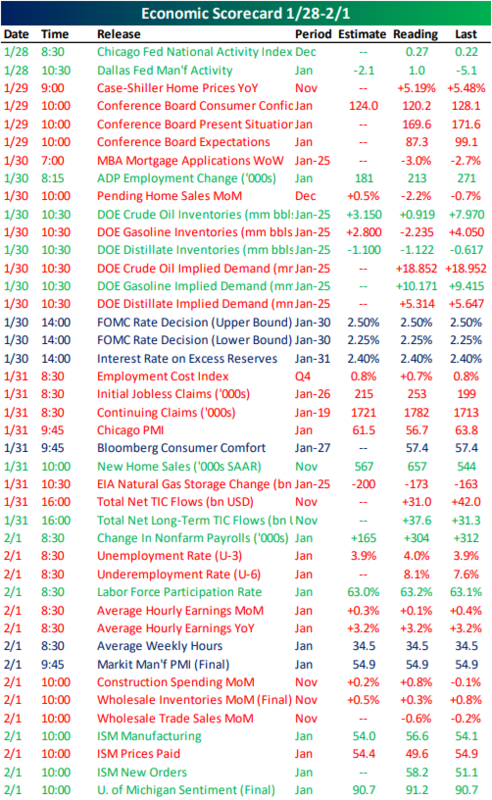 Macroeconomic data takes a bit of a breather this week as only 15 releases are scheduled. 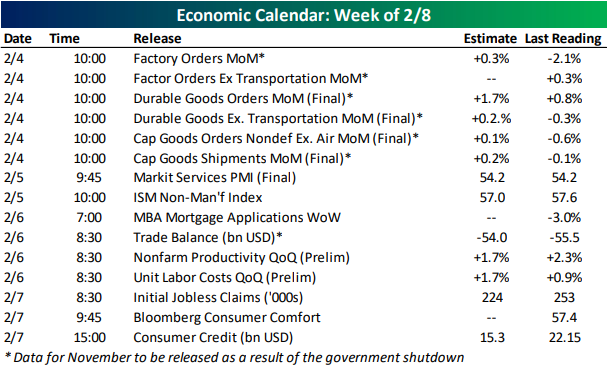 Many of the week’s releases are actually November data points that had been postponed due to the government shutdown. Later this morning we will get November Factory, Durable Goods, and Capital Goods Orders and Shipments which are forecast to come in stronger than the prior print. Tuesday will follow those releases up with the services component of global Markit PMIs. The ISM Non-Manufacturing index is set to come out not long after that. On Wednesday, the Treasury will release trade balance data for November which is expected to come in at a slightly smaller deficit. Also coming out Wednesday morning is preliminary productivity and labor cost data for Q4. While Nonfarm Productivity is expected to drop by 0.65 QoQ, labor costs are looking to rise considerably. While there are no releases scheduled for Friday, Consumer Credit on Thursday will close out a relatively quiet week for economic data. Fortunately, hundreds of earnings reports will make up for it!